We’ve made some updates to the design of AgencyBloc and added a few new things too. Below are the details for what was released. 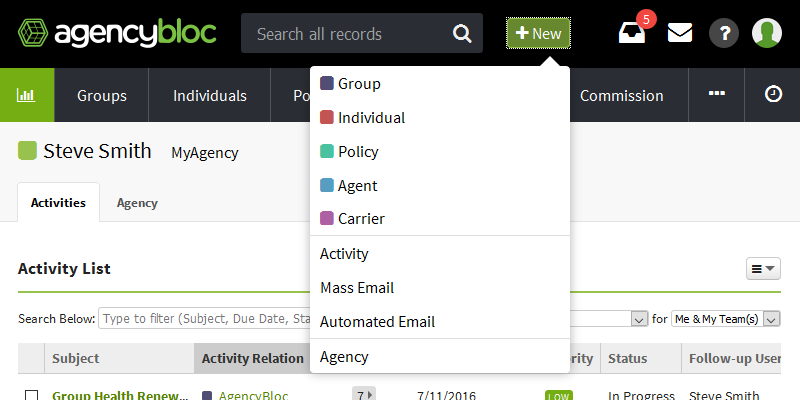 The updated design brings more flexibility and ease of use to AgencyBloc while paving the way for future enhancements. With more and more people using both large monitors and mobile devices, the updated design better utilizes the space on screens of all sizes. So, if your screen size is large enough and the resolution is set higher, the tabs will display along the left side. If your screen is smaller and you have a lower resolution or are using a tablet or smartphone, the tabs will display across the top. The update has the same basic layout you’re used to with some changes and a few new features. There are new icons at the top of AgencyBloc. You’ll notice a few things have moved, and we’ll go over those details below. To catch up on your activities, there is now an item at the top of AgencyBloc called Your Activities. When you have activities due today or that are overdue, you’ll see a red badge containing a count of those activities. Additionally, you can see a count of All Open activities. Select an option to jump to your Activity Dashboard to view your activities. Before, when you had Unassigned BlocMail, you would see a red number at the top of AgencyBloc. Now, you’ll see a mail icon. When there are unassigned items a red badge will display with the count of unassigned BlocMails. The cog, the gearwheel, we all had our favored name for it. We’ve updated it to reflect better its purpose. If you have a profile picture uploaded, you’ll see it here. Otherwise, you’ll see a generic green user icon. Under this area, you can manage My Account, Settings, and Subscription, based upon your role and security groups settings. What you won’t see is Email Campaigns or Lead Forms, those have moved. We’ve refined the New and Recent records buttons. The +New button is now next to the search all records area and includes the option to create new Mass or Automated Emails (if you’ve activated this feature). On smaller screen sizes you’ll find recent records in the main menu under ‘clock’ icon. For larger screen sizes, you’ll find them listed under the main menu items on the left. Previously, some of the features in AgencyBloc were tucked away in the cog/gear wheel. To make those features more accessible, we’ve updated the main menu to include Reports, Email Campaigns, and Lead forms under sections labeled ‘Use your Data’ and ‘Gather Data’. On smaller screen sizes you’ll find these items in the main menu under three dots. For larger screen sizes, you’ll find them listed separately along the left side. As always if you need anything, please let us know. Also, let us know if you have any thoughts on the updated design. Thanks!